A reporter’s mentor is killed while investigating a murder and she is quickly put on the trail to break the story open. When she finds herself over her head in a dangerous world of treachery, greed, power, and revenge, it is going to take all of her ingenuity—and a lot of help—if she’s going to solve the case and make it out alive. A first-rate page-turner filled with mounting, almost unbearable suspense, Roz Russell’s debut looks deep into the inner dimensions of the artistic mind to ask: is murder a form of art? Joe Taylor, the leading investigative reporter for the Albuquerque Post, has mentored Jessica Curtis for the past six years. But now Joe's dead—murdered—and the only thing Jessica knows about the story he’d been working on, the Michael Lange murder, is that it happened three years ago and the killer has never been found. Now the investigation is hers and she’s about to realize she was a lot safer when she knew a lot less. A high profile art dealer and construction entrepreneur in Santa Fe, Lange had dirt on every friend and foe in the tawny northern New Mexico city—and he wasn’t afraid to use it to his advantage. And when the body count rises and the danger escalates, Jessica is no closer to finding the murderer and everyone remains a suspect—including the enigmatic artist she has begun an affair with. As she scrambles to stay alive and break the story open, Jessica must answer the ultimate question: can she do so before the killer adds her to the list of victims? A mystery novel that explores the power of art, Russell delivers a captivating meditation on fate, the inevitability of certain life events, and the cascading consequences of one act as it influences everything that happens afterwards. 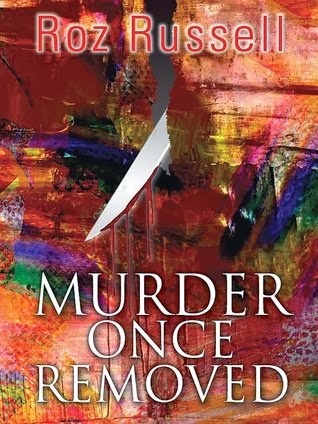 Perfectly paced with engaging characters, razor sharp turns and surprising twists, Murder Once Removed is a taut, suspenseful mystery that will keep you guessing until the final, explosive revelation. The synopsis pretty much tells you everything you need to know about Murder Once Removed, so I won't go rehash those here. However, I found the plot to be quite clever -a reporter investigating the murder of another reporter. From the get go, Russell takes the reader on a merry chase with various twists and turns and plenty of surprises. While I didn't love the characters, I did like most of them. I just didn't connect to anyone on a strong level. But, some of them were very well developed and easy to believe to be someone you may know in your own circle - modern and relatable. Russell takes her time pushing the plot forward, but not in such a manner that the reader gets bored. You never know what is going to happen next and that's what I find enjoyable, being caught off guard, yet really liking the surprise. I enjoyed the art aspect of the story as well as the high stakes. If you enjoy page-turning suspense, you will probably enjoy Murder Once Removed. It's a wonderfully suspenseful book!